This article will be rather heavy on graphics, so I shall use lower resolution images as much as possible. Screenshots are under Fair Use for information and educational purposes. Screenshots are necessary, since the cultist under discussion has been known to change or delete items when caught. These things are difficult to write. Not only do they take a great deal of time to compile links, Bible verses, screenshots and so forth, but I have to be certain that I am being accurate, doing the right thing and, above all, seeking glory to God, not glory to Bob. Such articles are not fun to write. When it comes to disagreeing on matters of doctrine, a Christian must be very careful and write about the teaching themselves rather than rail against a brother or sister in Christ — especially regarding nonessentials. This is different. I have others, including the pastor, praying about this endeavor. Yes, I'm taking it very seriously. Exposing false teachings is necessary, even though it can be unpleasant. When someone pretends to be a follower of Christ but is proclaiming outright heresy, hindering the gospel and attacking God's people, they should be named and their works condemned (Gal. 1.9, 1 Tim. 1.20, 2 Tim. 2.17, 2 Tim. 4.14, 1 John 2.19, Eph. 5.11, 2 Cor. 10.4-5). Elsewhere, I wrote an article calling for discernment among Christians, and not to simply accept the word of someone who claims to be a biblical creationist. Cults will pretend to be creationists and use the matter of origins to snare people into their organization. I urge you to read "Danger for Christians and Creationists" to get background on the cultist Page that I am going to discuss; the main point is to compare what someone says with Scripture (Paul himself was not believed outright, the Bereans checked what he said against the Word of God as mentioned in Acts 17.11). Small note of explanation: I capitalize "Page" because Facebook does it, and it helps distinguish between one of theirs and, say, a page on the Web. Although this is primarily about a certain Page on Facebook, the principles involved apply to other circumstances the reader may encounter. 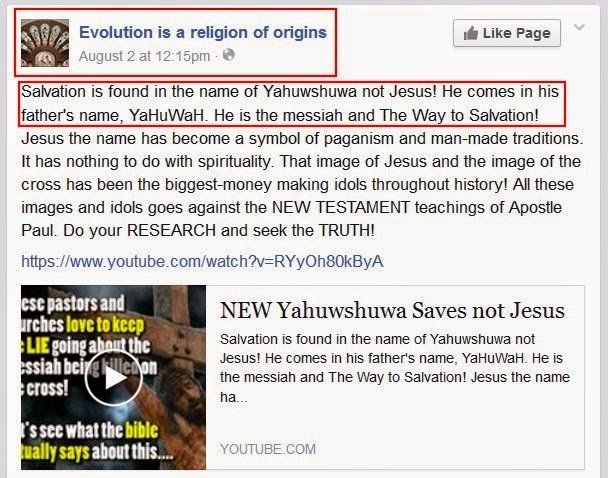 The Page is called "Evolution is a Religion of Origins". (Evolution is a religion of origins.) Previously, I was never comfortable with the way they were extremely caustic to evolutionists and even to Christians who did not like their approach, although he does reject evolution. Also, they have a fondness for using the word "Yahuwshuwa" instead of Jesus. 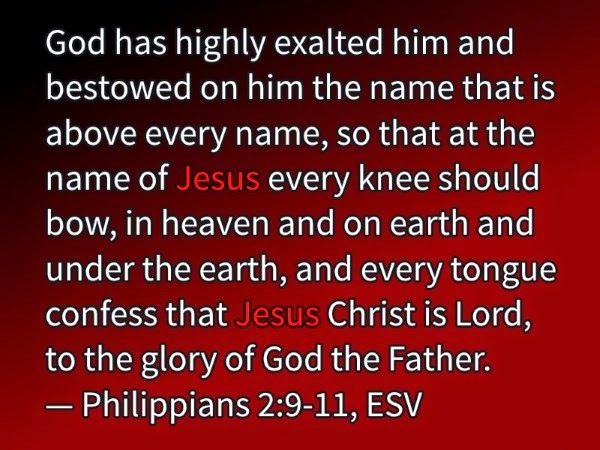 I just thought it was an affectation for an alternate version of the name of Jesus, and "Yahuwah" was another name for Yahweh. And he did post occasional good articles from reputable creation science ministries — but that is part of the lure. Some people have become legalistic about the celebration of Easter and Christmas. Their enthusiasm for telling other Christians not to celebrate was based not only on false information, but a disregard for the Scriptures. 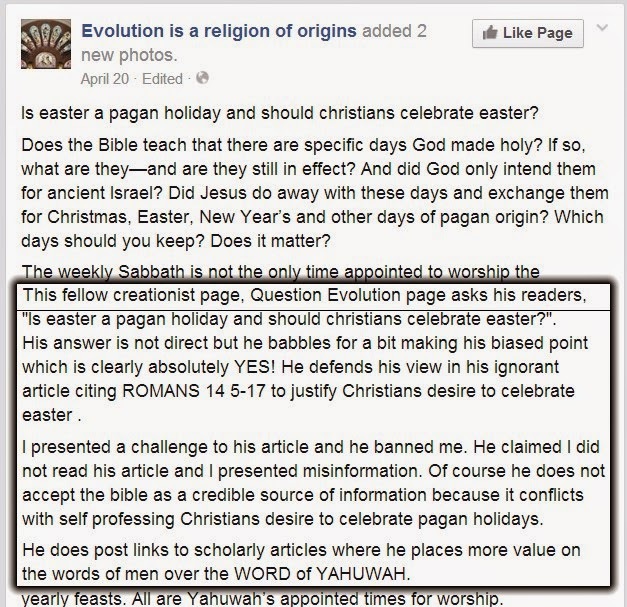 On April 19, 2014, I posted "Is Easter a Pagan Holiday, and Should Christians Celebrate It?" I hope you will read it, as it provided links to well-researched, accurate information that Christians needed to know about the history of that holiday, as well as some biblical perspectives on legalism, pride and judgmental attitudes. Click for larger. This is edited, the original screenshot is huge. Again, Fair Use for education and information. I have to admit that this caused me some consternation. Several people looked at the post as well as the Page, and realized that I was dealing with a cultist. He kept referring to a site called "World's Last Chance", which is (yet another) cultist claiming to be the only one using God's true name. This one is in the Sacred Name cult. 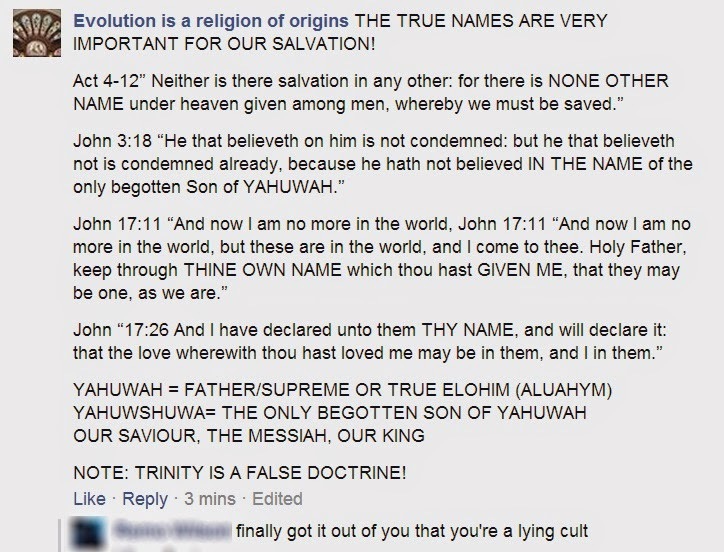 The various strange names that the cult uses have no bearing in reality. Also, he says that I am more interested in "the words of men over the WORD of YAHUWAH". Well, this Yahuwah character is an idol that a cult has created, and he is doing what he decries, taking the words of men in that cult over the real Word of God! Click for larger. Again, Fair Use for education and information. Click for larger. I edited in a screenshot for the location for his URL, which has since been changed. Click for larger. This is edited, the original screenshot is too large, again.The emotion-driven rant is similar to atheists that I have seen going haywire. Atheists, compromising Christians, cultists and others have this in common, that they have disdain for the Word of God. They also tend to get abusive when confronted with the truth (though Mormons and Jehovah's Witnesses tend to be far more civil). Some may claim that they believe the Bible, but they elevate the opinions of others (including philosophy, science, cult publications &c.) above the authority of the Bible, which is the Christian's foundation. Some people say, "Yes, but we get good information about evolution from them!" Is it worth giving them approval and possibly having others deceived? We can and should pray for their salvation in the true Jesus Christ, show them their errors, and warn others of false teachings and deceptions. This is not the only pretend-Christian cult, but hopefully, you will examine claims and teachings from groups you encounter so you can decide to avoid them or not. 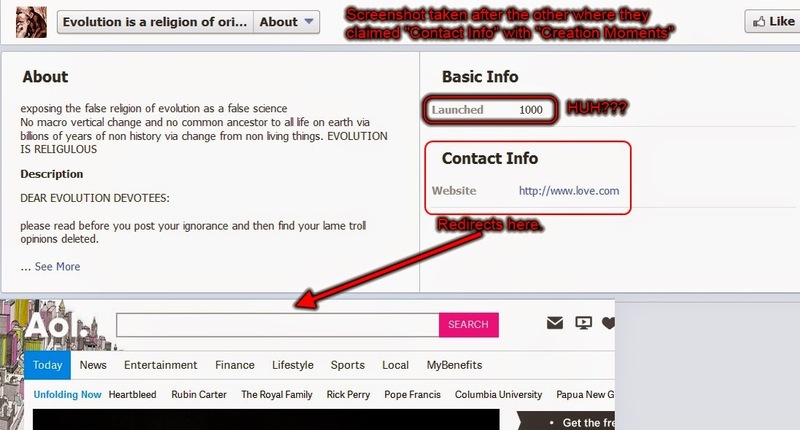 I cannot (and will not) tell people that they cannot go to Pages such as "Evolution is a Religion of Origins". I can warn you and urge you to spend your time elsewhere. In the end, it's up to God and you. I pray for the readers of this article, that you will have wisdom and discernment. Addendum: ERO became hysterical. He reposted the same libelous rant several times with different pictures: First, second, third, fourth. LOL this guy is spreading his own word and telling his sheeple to stay clear of this page. I doubt many of them will come here and confront me on this page with any credible evidence by reputable scholars. He has sucked them in with creationism and then his own biased brainwashed ignorant opinion/interpretation becomes their gospel. There were refutations given, including a link to Dr. Brown (also used in this article). He replied with more of his cult propaganda and ignored them. The remark about "all reputable scholars" is ridiculous, hence no substantiation was offered. A problem we have with atheists, evolutionists, liberal "Christians" and cultists (such as ERO's "Sacred Name") is that they are demonically influenced, as is demonstrated by this guy. But that is an article for another time. 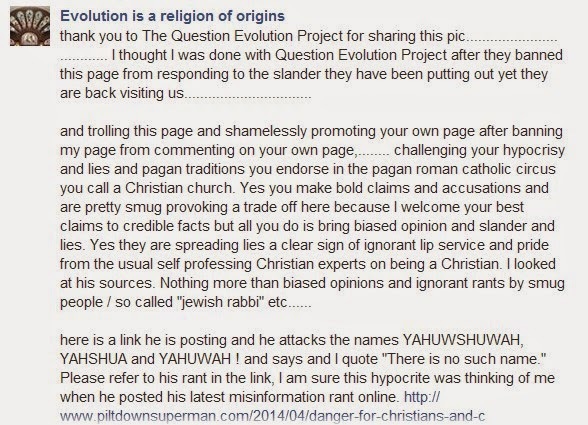 Addendum 2: Another creationist Page that lacks credibility, veracity and discernment actually came to the aid of the cultist! Click for larger. The name of the questioner is blurred. The original screenshot is too large, again. As before, Fair Use for education and information.